^ above: At the wedding lunch, [he] betrays his wife with his [male] friend. Fell in acid, Lecchese dies after three months. Terrible accident: a woman run over and killed in the crosswalk. Alarm on the Grigna (a local mountain) – six hikers lost. left: It’s a long story, read it here. 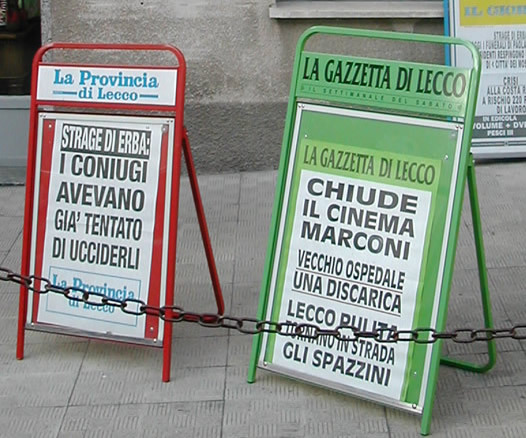 Clean Lecco – the street cleaners return to the street (I hadn’t noticed they were missing). The “spider” Corti fights for life. At first glance, this headline seems very strange, but if you live in Lecco, you know what it’s about: the Ragni [spiders] of Lecco are a longstanding club of local mountaineers, famous for exploits such as the first ascent of K2. Minors and disagio – boom in foster care in the area. 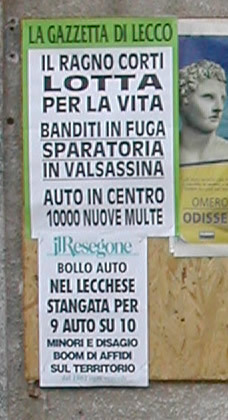 Disagio is difficult to translate. Agio means comfort, feeling at ease. Disagio is the opposite, but it’s also used as a bureaucratic/social service term for severe family troubles, economic and social disadvantages, etc. Got any good headlines to share? 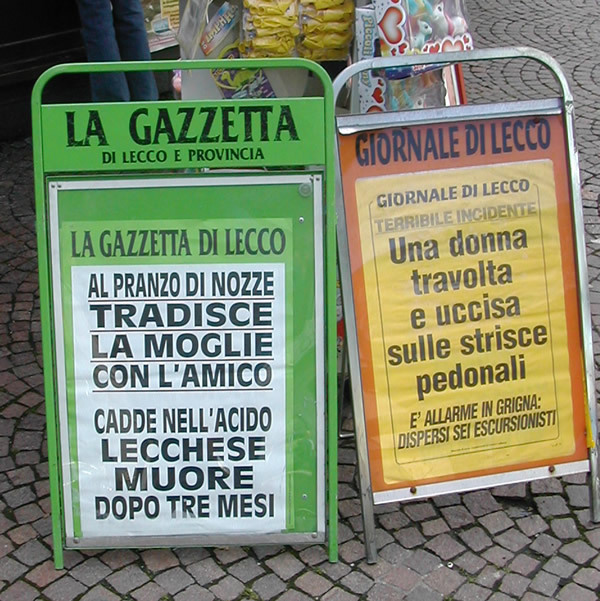 This entry was posted in Italian culture, Italian language, living in Italy and tagged Italian culture, Italian language, Italian newspapers, living in Italy on January 3, 2007 by Deirdre Straughan.